The Hockney at the Royal Academy in Mayfair was one of the most hyped exhibitions in London. And, Burger and Lobster, Goodman’s latest Restaurant, in Mayfair is one of the most hyped restaurants… despite the fact that it is somewhere that only has three main dishes on the menu! So, as a cynical hater of hype, what on earth possessed me to do both in one day? Well, partly that in common with a lot of new openings, Burger and Lobster in Mayfair has a ‘no bookings’ policy. Whilst the Hockney exhibition has a ‘have to book’, even for friends. And when I looked at booking, the closest I could get to ‘lunchtime’ was 1.30. So there was some logic in doing both on the same day because I hoped by the time we left the exhibition, the wait for the restaurant would be minimal. I don’t really like queues. Especially for restaurants if I am hungry! 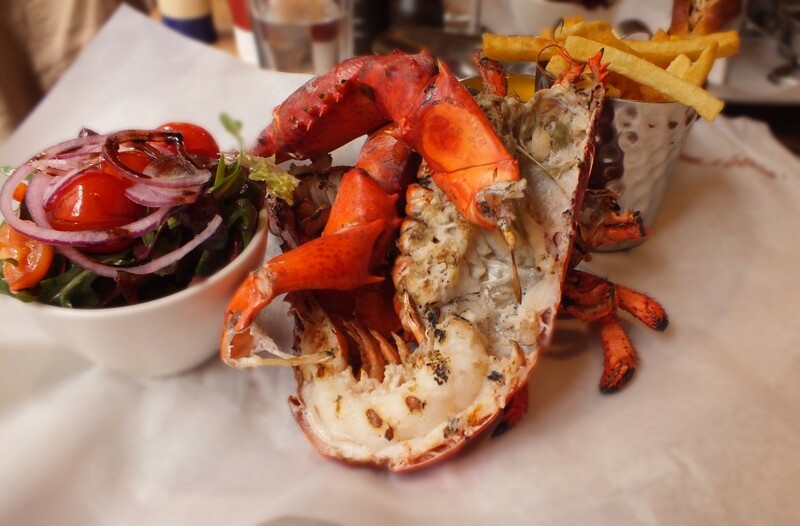 But I DO like Lobster, although up until now, I’ve eaten Cornish Lobster when in Cornwall and feasted rather hedonistically at La Coupole in Paris on whatever they happen to be serving (I think the Champagne addled my brain that night). The Lobsters at Burger and Lobster are flown over live from the USA and kept in big vats in the basement! Kind of deathrow for lobsters I guess. Arriving at the RA, there were queues throughout the main courtyard. I walked confidently up to the front only to find that there were queues even for pre-booked friends! Thankfully not too long. The exhibition itself was actually too busy to properly appreciate, at least for me. Some of the exhibits were fantastic, blazing colour that I can still see if I close my eyes. And there were amazing demonstrations of how art and technology can work together. I really liked the dynamic video collage of the woods and as an iPad user was astounded at the iPad pictures. But, at times for me, it was just a bit too much and a bit too crowded. Of course it didn’t help that I was VERY hungry by now. I’d put off eating anything in anticipation of a large lobster…and then got worried we’d have to queue again for lunch at Burger and Lobster. As it happens I needn’t have been concerned. Burger and Lobster, which is just a few streets down from Green Park Tube, was busy but not so busy that we had to wait for a table. And, the lack of menu made choosing food very quick and service equally speedy. I ordered a steamed then grilled lobster while my companion asked for a lobster roll. Our platters both came with sides of fries, salad and two jugs of melted butter, one lemon scented. The lobster was generously sized and perfectly cooked. Nothing chewy, just tender, fresh lobster. The fries beautifully crispy and the salad a nicely dressed bowl of mixed leaves and tomato. Really nothing you could take exception to. 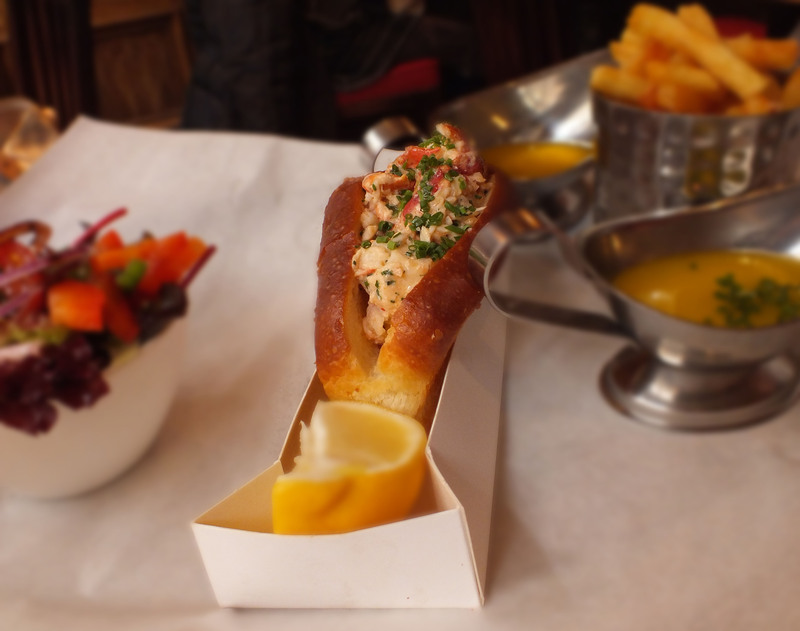 The lobster roll was served in what was more of a brioche type of roll than a conventional roll. And it was, well, stuffed! 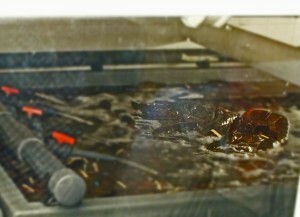 We took a little tour of the restaurant too see the lobsters. Four big tanks of beasts awaiting their fate in the basement. 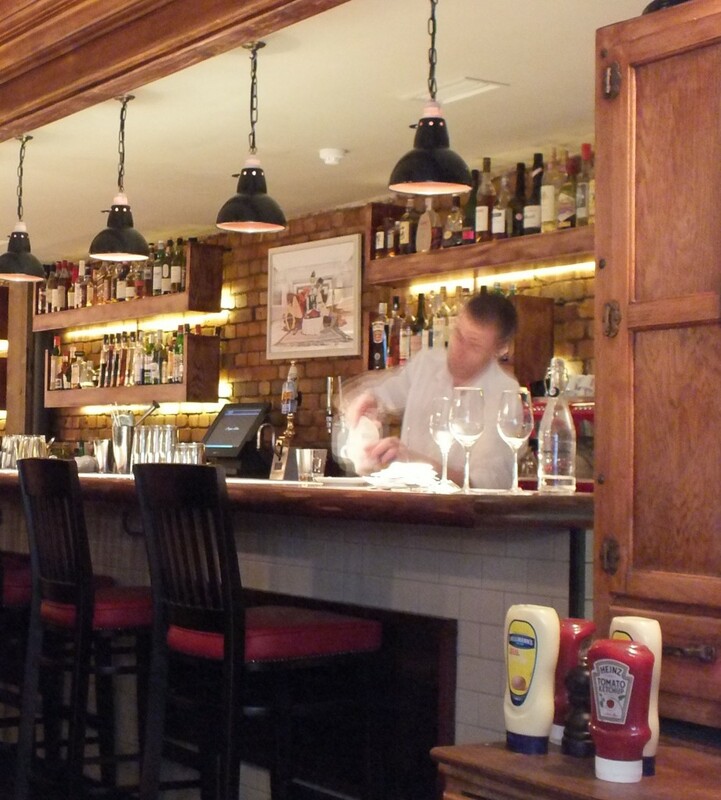 Apparently Burger and Lobster gets through around 400 of them a day. And, after a quick coffee left, around £58 worse off (I had a nice glass of wine too). It was a very pleasant experience (apart from looking at death row). Not too bad on the pocket, no queuing (at 2.30pm on a weekday) and good sized lobster.